Citation: Junainah EM, Huwait HF, ArefAlbezrah NK et al. Uterine angioleiomyoma, A distinct variant of uterine leiomyoma.. Allied J Clinicl Path. 2017;1(1):1-3. Uterine leiomyomas or fibroids are benign smooth muscle tumors of the uterus. Most women are asymptomatic while others complain of painful or heavy periods. If large enough, they may push on the bladder causing a frequent need to urinate. Occasionally, leiomyoma may cause infertility. The exact cause is unclear. However, fibroids may run in families and appear to be partly determined by hormone levels. Obesity is considered one of the risk factors. Uterine angiolieomyoma is one of the extremely rare variant and only six cases have been reported in the literature up to date. A leiomyoma, also known as fibroids, is a benign smooth muscle tumor [1-4], that very rarely becomes cancer (0.1%). They can occur in any organ, but the most common forms occur in the uterus, small bowel, and the esophagus. Polycythemia may occur due to increased erythropoietin production as part of a paraneoplastic syndrome. It may lead to excessive menstrual bleeding (menorrhagia) and often cause anemia which may lead to infertility. A rare form of this tumor is uterine angioleiomyoma. It is a benign tumor consisting of a mixture of dilated thick and thin wall blood vessel and smooth muscle. These tumors are monoclonal and non-random chromosomal abnormalities have been seen in 40% of the tumors. It usually occurs in middle-aged women. These tumors can be single or multiple. It may present as submucosal, intramural, or subserosal whorled nodules [3,5-9]. Histopathologically, it shows interlacing smooth muscle bundle with predominant spindle cells swirling around thick-walled blood vessels with very rare mitotic figures and no atypia or necrosis. However, cases with marked nuclear atypia and multinucleated giant cells have been reported. The tumor cells are immunoreactive for smooth muscle actin, desmin, hcaldesmon, and progesterone receptor. In the smooth muscle component as well as in the vascular wall, CD34 and CD31 are characteristically highlighting the endothelial cell lining the vascular component. The most serious complication is spontaneous rupture that is life-threatening especially in pregnancy. There are no specific imaging findings; therefore, a preoperative diagnosis is extremely difficult. Significant cytological atypia or raised cancer antigen CA 125 levels need to be evaluated carefully for possible malignant changes [10-12]. A 42-year-old woman P7+1, all SVD, who presented to a private hospital in Jeddah (Aya Hospital), with a chief complaint of severe dysmenorrhea and cyclic lower abdominal pain recurring for more than 2 years. Pelvic ultrasound was performed and showed a usual fibroid mass of 9 × 8 cm. The patient then underwent myomectomy in which the specimen was sent to Almamlka Lab’s Histopathology Department and the diagnosis issued was uterine angioleiomyoma. Grossly, tumour received in formalin; consist of single piece of fibrous grey-tan mass, measured 14 × 11 × 9 cm. Sectioning showed worlly appearance with some hemorrhagic area. On microscopic examination, it showed interlacing less wellordered, smooth muscle bundle intersecting each other with fusiform cells without no mitosis seen in 10/HPF. Numerous thick-walled vessels with partially patent lumens are seen, interpreted in between hyalinised areas. There was no evidence of atypia or malignancy (Figure 1). 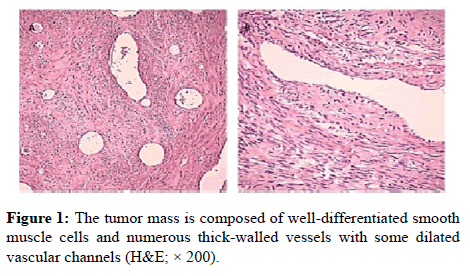 Figure 1: The tumor mass is composed of well-differentiated smooth muscle cells and numerous thick-walled vessels with some dilated vascular channels (H&E; × 200). Immunohistochemistry (CD34 & SMA) were performed using manual procedure which encompasses antigen retrieval and applying the labelled antibody. CD34 showed positive expression of the endothelial cells lining the vascular spaces. SMA showed positive stain in the vascular wall as well as the leiomyoma fascicles, (Figure 2). The patient went home in good condition, and returned to her usual daily activities, two weeks after the operation [12-17]. 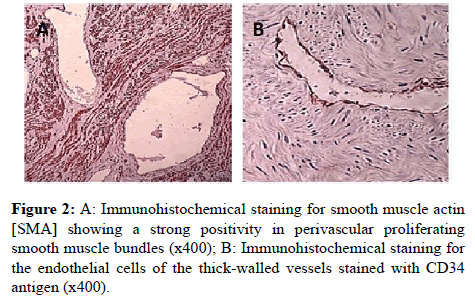 Figure 2: A: Immunohistochemical staining for smooth muscle actin [SMA] showing a strong positivity in perivascular proliferating smooth muscle bundles (x400); B: Immunohistochemical staining for the endothelial cells of the thick-walled vessels stained with CD34 antigen (x400). World Health Organization (WHO) does not classify uterine angioleiomyoma as a separate entity or leiomyoma, by literature review we found that all postoperatively diagnosis of angioleiomyoma was up to 0.40% cases all over the world [18-27]. Age of presentation ranges from 43 to 69 years [28-30]. Frequently patients were presented with per vaginal bleeding. Moreover, multipleangioleiomyoma is likely to undergo ischemic changes; therefore, pelvic pain will be the presentation symptom [2,22]. Uterine bleeding often responsible for anaemia, which results from dysregulated growth factors and their receptors, which affect vascular morphology and regulate angiogenesis . Basic fibroblast growth factor is said to play a special role in that pathology [5,13]. Literature review report cases of angioleiomyoma which was associated with several and massive per vaginal bleeding, and this some time is a life threat [4,22,24,27]. On a rare occasion, a case of coagulopathy due to large area of necrosis was reported . Another reported case of hyper fibrinogen anemia in a patient with uterine angioleiomyoma was noted . However, the most serious complication is rupture of the uterine body . Almost in half of the cases (about 44.4%) of the patient required blood transfusion mainly due to associated haemorrhagic anaemia. In general, clinical findings of atypia, mitosis, pleomorphism, and necrosis were absent in benign uterine angioleiomyoma. However, case of mitosis of 2 per 10 high-power fields is acceptable in arrange of benignity [29-32]. In one case the areas of mild cellular atypia and slight increase in mitotic activity, mean 3-4 mitoses per 10 [28,21,26]. [1,22,27,30] Radiological evaluation (Ultrasonography of the pelvis) showed large heterogeneously, hypoechoic lesion, mainly seen in posterior rmyometrium) indenting and displacing endometrial echo. No definite hyperechoic foci to suggest calcification seen within the lesion. Grossly present as a well-circumscribed masses arising from the uterine corpus. They range in size from 5 cm to 20 cm in the maximum dimension [5,6,10]. These tumours can be submucosal, intramural and subserosal [12,14,15]. On sectioning, the angioleiomyoma are grey tan, with whorled appearance and foci of haemorrhage, and necrosis. Histologically, angioleiomyoma composed of interlacing smooth muscle bundles, with spindle cells swirlaround thickwalled blood vessels. Most of theselesions lack mitotic figures, pleomorphism, or necrosis. Mitosis up to 2 mitoses per 10 high power fields was still considered within the benignity range. However, it’s important to emphasize that extensive sampling is recommended in cases where there is nuclearatypia or mitosis in order to exclude a leiomyosarcoma. Other degenerative changes in form of myxoid change, edema, and hyalinised degeneration with fibrin deposition in the vessel wall are observed [5,6,8]. In immune histochemical test, the perivascular smooth muscle cells and the muscular wall of thick blood vessels showed immune reactivity for the muscle marker (SMA & caldesmin). The endothelial cells stained with vascular marker, CD34 & CD31. Angioleiomyoma is an extremely rare variant of only 0.34-0.40% among all cases of uterine leiomyomas. It behaves in a benign fashion, but is prone to complication related to associated haemorrhage and ischemic changes as well as the associated paraneoplastic symptom. Sahu L, Tempe A, Agrawal A. Angioleiomyoma of uterus. J Obstet Gynaecol 2012; 32: 713-714. Handler M, Rezai F, Fless KG, Litinski M, Yodice PC. Uterine angioleiomyoma complicated by consumptive coagulopathy. Gynecol Oncol Case Rep 2012; 2: 89-91. Diwaker P, Pradhan D, Garg G, Bisaria D, Gogoi K, et al.. Uterine angioleiomyoma: A rare variant of uterine leiomyoma--A case report and literature review. J Cancer Res Ther 2015; 11: 649. Sharma C, Sharma M, Chander B, Soni A, Soni PK. Angioleiomyoma uterus in an adolescent girl: a highly unusual presentation. J Pediatr Adolesc Gynecol 2014; 27: e69-71. Stewart EA, Nowak RA. Leiomyoma-related bleeding: a classic hypothesis updated for the molecular era. Hum Reprod Update 1996; 2: 295-306. Koerselman J, van der Graaf Y, de Jaegere PP, Grobbee DE. Coronary collaterals: an important and underexposed aspect of coronary artery disease. Circulation 2003; 107: 2507-2511. Van Royen N, Piek JJ, Schaper W, Bode C, Buschmann I. Arteriogenesis: mechanisms and modulation of collateral artery development. J Nucl Cardiol 2001; 8: 687-693. Rajotte D, Arap W, Hagedorn M, Koivunen E, Pasqualini R, et al.. Molecular heterogeneity of the vascular endothelium revealed by in vivo phage display. J Clin Invest 1998; 102: 430-437. Browder T, Folkman J, Pirie-Shepherd S. The hemostatic system as a regulator of angiogenesis. J Biol Chem 2000; 275: 1521-1524. Walocha JA, Litwin JA, MiodoĹ„ski AJ. Vascular system of intramural leiomyomata revealed by corrosion casting and scanning electron microscopy. Hum Reprod 2003; 18: 1088-1093. Tabibiazar R, Rockson SG. Angiogenesis and the ischaemic heart. Eur Heart J 2001; 22: 903-918. Mizia-Malarz A, Sobol G, WoĹ H. [Proangiogenic factors: vascular-endothelial growth factor (VEGF) and basic fibroblast growth factor--the characteristics and function]. Przegl Lek 2008; 65: 353-357. Wierzbowska A, Wrzesien-Krus A, Robak T. Angiogenezaijejznaczenie w biologiiostrejbialaczki szpikowej. ActaHaematol Pol. 2002;33:5. Zielonka TM. Angiogenesis. Part II. Modulators regulating neovascularization. AlergiaAstmaImmunologia. 2004;9:25–31. Lee PS, Poh KK. Endothelial progenitor cells in cardiovascular diseases. World J Stem Cells 2014; 6: 355-366. AuguĹ›ciak-Duma A, Siero Ĺ AL. [Molecular characteristics of leiomyoma uteri based on selected compounds of the extracellular matrix]. Postepy Hig Med Dosw (Online) 2008; 62: 148-165. Knapp P, Chabowski A. Molekularneicytogenetycznepodstawyrozwojumiesniakówmacicy. PostepyHig Med Dosw. 2012;66:23–32. Hennig Y, Caselitz J, Stern C, Bartnitzke S, Bullerdiek J. Karyotype evolution in a case of uterine angioleiomyoma. Cancer Genet Cytogenet 1999; 108: 79-80. Matsuyama A, Hisaoka M, Hashimoto H. Angioleiomyoma: a clinicopathologic and immunohistochemical reappraisal with special reference to the correlation with myopericytoma. Hum Pathol 2007; 38: 645-651. Garg G, Mohanty S K. Uterine angioleiomyoma: a rare variant of uterine leiomyoma. Arch Pathol Lab Med 2014; 138: 1115-1118. Hsieh C H, Lui CC, Huang SC, Ou YC, ChangChien CC, et al.. Multiple uterine angioleiomyomas in a woman presenting with severe menorrhagia. Gynecol Oncol 2003; 90: 348-352. An J, Kim HN, Cho YH, et al. Uterine vascular leiomyoma with a fat komponentmimickong angiomyolipoma: a case report. J Wom Med. 2010;3:130–133. Eley KA, Alroyayamina S, Golding SJ, Tiam RN, Watt-Smith SR. Angioleiomyoma of the hard palate: report of a case and review of the literature and magnetic resonance imaging findings of this rare entity. Oral Surg Oral Med Oral Pathol Oral Radiol 2012; 114: e45-49. Culhaci N, Ozkara E, Yüksel H, Ozsunar Y, Unal E. Spontaneously ruptured uterine angioleiomyoma. Pathol Oncol Res 2006; 12: 50-51. Sikora-SzczeĹ›niak DL. [PEComa of the uterus--a case report]. Ginekol Pol 2013; 84: 234-236. Laxminarayana B, Miya MA, Venishetty H, et al. Angioleiomyoma of uterus – a rare case report. J Dent Med Scien. 2015;14:60–63. Kamath MS, Acharya M, Kamath V, et al. J Gynecol Surg. 2014;30:50–52. Gómeza FJ, Machina PF, Dastib CR. Uterine angioleiomyoma with macrovascular and microvascular histological patterns. ProgObstetGinecol. 2015;58:33–36. Demiray H, Gungorduko K, Aydina O. Uterine angioleiomyoma: case report. J Case Rep. 2014;22:69–73. Zizi-Sermpetzoglou A, Myoteri D, Arkoumani E, Koulia K, Tsavari A, et al.. Angioleiomyoma of the uterus: report of a distinctive benign leiomyoma variant. Eur J Gynaecol Oncol 2015; 36: 210-212. Grigoriadis C, Androutsopoulos G, Zygouris D, Arnogiannaki N, Terzakis E. Uterine angioleiomyoma causing severe abnormal uterine bleeding. Clin Exp Obstet Gynecol 2014; 41: 102-104.